General Overseer, Evangelical Church Fellowship, Kaduna, Pastor Yohanna Buru, has said that breast Cancer is the second leading cause of deaths in women which 458,000 people die from worldwide yearly. He made the disclosure at the Breast Cancer campaign programme in Kaduna with the theme: ”Be More Than Pink and Encourage Women Survivors To Live”. He stressed the need for stakeholders, humanitarian organizations and wealthy persons to double-up efforts to fight against breast cancer, to save millions of women from the disease. Pastor Buru said, Internally Displaced Persons (IDPs), prison inmates and destitute, were chosen because they are the categories of persons that are relegated during health sensitization and campaign programmes. The team of Christian and Muslim clerics headed by Buru had embarked on a visit to the IDPs, Destitute and female inmates,with students to sensitize women on various ways to prevent them against all forms of cancer diseases. According to Pastor Buru; “We are all in pink clothe because the world recognize Pink Colour for Breast cancer awareness, and we have come out today to join the rest of the world in support of the fight against breast cancer; as well as support Nigeria and African women across the globe to end breast cancer. “We need to sensitize other neglected women in the society on dangers, signs and symptoms of Breast Cancer. “There are many women in Nigeria that need to be told about cancer, but so many factors hinder NGOs and CSO with humanitarian organizations from reaching out to them,” he said. 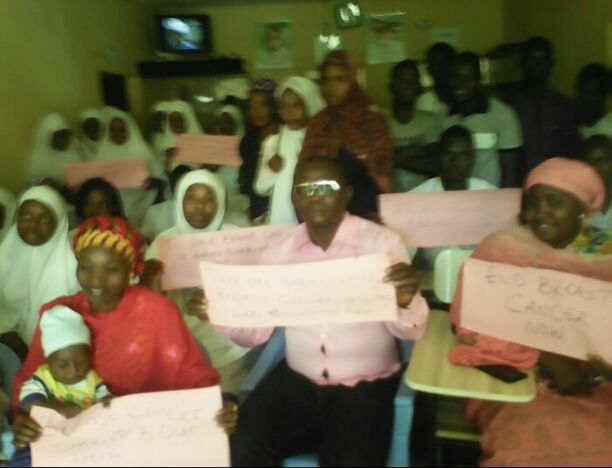 In the same vein, Sheikh Lawal Maduru, one of the Imams in the team urged people to wear Pink T-Shirt, Robber band, Fez-cap, something in pink or paint their houses or cars with Pink Colour in support of breast cancer survivors. Responding on behalf of inmates at the School of Rehabilitation Centre, Rigasa Kaduna, Maryam Musa said that this is the first time, she has seen people approach her on the issue of breast cancer. She added that knowledge of cancer will help her, and fellow inmates on steps to take in preventing breast cancer disease. Founder, Womenhood Foundation of Nigeria, and Director, Womenhood School of Health Science, Hajiya Maryam Abubakar, urged women not to keep food in fridge for too long to avoid cancer. She called on women to always have self breast examination, by touching their breast in search of lump, as well as avoid second hand cloth, canned foods and shun drug abuse.